South Sudanese President Salva Kiir Tuesday denied meeting Sudanese rebels, saying Juba was not supporting or hosting insurgents fighting the Sudanese government. 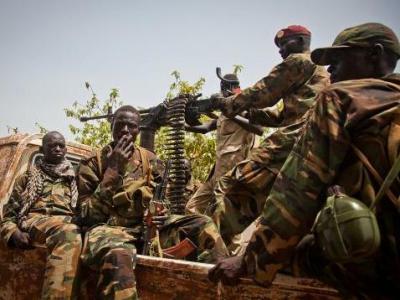 The Sudanese intelligence agency on Monday accused President Kiir of hosting rebel leaders of the Sudan People’s Liberation Movement-North (SPLM-North) in Juba from Wednesday to Saturday last week. Khartoum warned Juba to stop backing the rebel group and avoid interfering in their country’s affairs.However, presidential spokesman Ateny Wek Ateny denied the accusations, saying that South Sudan has no interest in destabilizing its northern neighbor since it battling several challenges such as rebellion and hunger. Ateny said South Sudan would continue to seek diplomatic avenues to address the recent row.”President Salva Kiir didn’t have any meeting at the weekend. We have no clue or else to where and when President Kiir met the rebels of North Sudan. South Sudan is struggling with so many difficulties and is not interested in meeting other people’s rebels,” he said. “We are going to engage with Sudan diplomatically and we want to assure them that South Sudan is not thinking of destabilizing because we have nothing to gain from destabilizing Sudan,” Ateny added. Sudan and South Sudan have regularly accused each other of supporting opposition groups fighting both governments. Sudan accuses the South, which separated from Sudan in 2011 following decades of armed conflict of supporting rebels in the Blue Nile, South Kordofan and Darfur regions.